This weekend was a good one in the shop. 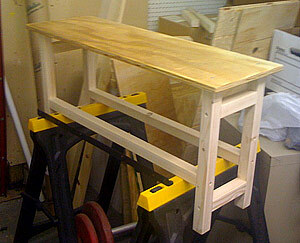 I completed finishing the work table and wedging bench using Minwax Polycrylic. It dries really quickly and the finish is very nice. I also built a “tool table” to go beside the wheel when I’m throwing. The table is 12″ wide, 36″ long and 18″ tall, just above the surface of the wheel’s base. The idea is to have more space to hold tools, clay and a peice or two that are “in the works”. The top was leftover plywood from the work table and wedging bench, and the legs represent a new investment of $3.64 for premium 2×2’s. The hardware was left over from the other table projects. So, now it’s time to turn my attention to (a) getting the kiln installed, along with the kiln vent, and (b) making modifications to the studio, like adding shelves, cleaning up existing shelving, propping up the sagging extension roof, rebuilding a new awning over the front door, … I still think I’m on track to get to work in the studio by May.